It is no wonder that Namibia was recently selected to host the 2013 Adventure Travel World Summit (ATWS), given the absolute stunning environment the country is fortunate to have, the variety in landscapes, relatively cheap and safe travel for tourists, and a growing trend in the variety in adventure tourism that is enough to give any adventure tourist a thrilling ride. The Namibian bid was introduced at the 2011 Adventure Travel World Summit (ATWS) in Chiapas, Mexico, by Namibian Minister of Environment and Tourism, Netumbi Nandi-Ndaitwah. The delegation consisted of a number of key players in the tourism sector, and they made presentations on strategic relationships, indigenous tourism and conservation in general. The attraction of Namibia for the delegates and a big reason for the successful outcome is the angle of people that came through. Tour operators felt that in the case of Namibia, ‘the people are the adventure’. According to the Minister, Namibia boasts with being a safe and secure adventure destination with excellent infrastructure in terms of road network, health and financial facilities, efficient telecommunication, rich cultural heritage and an award winning community based natural resource management program which uniquely combines tourism, conservation and community development. “And to round it all, the warmth of our people is our strength,” she told delegates at the recent Namibia Tourism Expo held in the capital, Windhoek. This is the first time that the Adventure Summit is taking place on the African Continent. What makes Namibia so great? Too much to mention really, but in the minister’s words: “Visitors have different needs, expectations and preferences. For example, we have mountainous landscape, excellent hiking trails, flagship national parks, Ramsar-declared wetland, rock paintings, above all authentic culture and traditions”. Namibia has so many options to choose from that it is almost impossible to mention them all. Let’s highlight just a few. With a pristine coastline running the entire western corner of Namibia, fed by the cold and plankton-rich Benguela Current from the south, Namibia is known for fantastic angling opportunities, and specialised angling tours are widely available. The world famous Tiger Fish in the Okavango and Zambezi rivers in the Caprivi are popular freshwater species, and so are catfish and bream. Sea fishing conditions in Namibia is reliant on the tide table, weather conditions and several other factors. A great kite- and windsurfing destination is the Walvis Bay Lagoon, where the water is shallow and flat, and winds just strong enough for this ever-popular international adventure sport. In fact, the lagoon is one of the most popular venues internationally for international records, because of its conducive conditions, and speeds of more than 80km per hour have been reached here. Windsurfing is also popular on the inland dams of Namibia. Namibia offers a variety of water-based activities for the enthusiast. On the lagoon at Walvis Bay, you can explore the lagoon with its rich birdlife and get close-up views of seals and possibly dolphins in a sea kayak. On the other hand, the Orange River in the south offers a prime canoeing destination that includes some great rapids, spectacular scenery, and a chance to really get away from it all. The rapids on offer in the Kunene River in the north are a bit more challenging, but a variety of experience levels are welcomed. In addition to river rafting or canoeing, the various dams in Namibia also offer great canoeing, inclusive of Von Bach dam (near Okahandja), Lake Oanob (near Rehoboth), Hardap dam (near Mariental) and the Naute dam (near Keetmanshoop). Namibia’s fantastic weather conditions – including the coastal wind conditions and clear skies over the desert and the interior, a variety of aerial sports can be included in any adventure itinerary. Ballooning is an activity that has become very popular in Namibia with a few choices in especially in the desert areas. Skydiving is another option for the adrenaline junkie, whether an experienced skydiver or a novice undertaking a tandem dive with an experienced instructor. With the emphasis on safety and the environment, the spectacular scenery viewed whilst floating peacefully under an inflated parachute, is definitely an experience to remember. The coastal dunes provide a perfect launching pad for paragliders, and this adventure sport has taken off with leaps and bounds in Namibia. With its long and mostly undeveloped coastline, Namibia offers plenty of opportunity for sunbathing on a tropical, often deserted stretch of soft sand. Luckily for the adventure traveller, these beaches are not packed with beach resorts, tourists and commercial amenities. Fronting the chilly Atlantic Ocean and often backed by the Namib Desert, the beaches of Namibia are at their very best along the Skeleton Coast, which can be found on the far north-western side of the country. This pristine wilderness offers a seemingly endless beachfront, superb photo opportunities and magical coastal road (permits are required). The coastal dune area offers great opportunities for a variety of adventure activities. The open dune areas are great for quad bikers to get their adrenalin fix, and tour operators offer tours that can range from the more adventurous, to those suited for families. 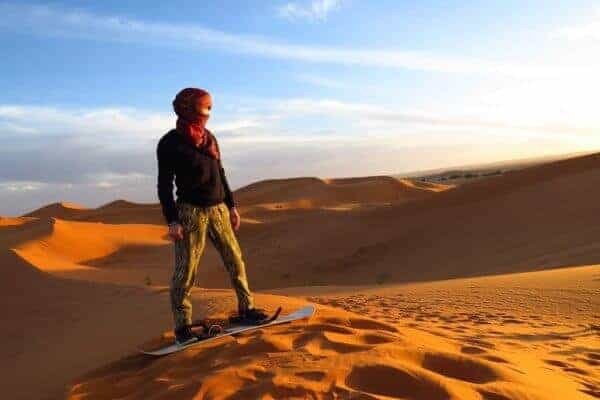 Sandboarding is also very popular, especially down the higher sand dunes like Dune 7. Racing down a dune at great speeds with the wind blowing in your face is an exhilarating adventure. Exploring the rugged scenery of Namibia from the back of a mountain bike is but a few phone calls or mouse clicks away. The country is very popular for mountain bike enthusiasts, and most tour companies offer mountain bike trips as part of their selection of adventure tours. These tours are planned to include professional back-up teams and generally the most scenic sections are covered on bicycles on dirt roads and tracks. There are also a few mountain bike events on the local calendar for those keen on competing, such as the gruelling Desert Dash, which is a 24-hour endurance race starting on the central highlands, through the desert, and ending at the scenic coastline. Heat, wind and fog makes this tough ride an annual favourite of riders from across the world. Other events are tailor-made for off-road and road cyclists of various fitness levels. An overland trip on a bicycle through Namibia will be an unforgettable experience. The sheer exhilaration of cycling past a small group of desert elephants, sliding down the dunes to get to their favourite water spots, is something that will be etched in a travellers mind forever. Hiking has been a very popular adventure activity in Namibia for many years. Popular hiking trails include the most famous Fish River Canyon hiking trail, which attracts many international visitors during its annual open season, but also lesser known trails like the Naukluft Trail in the Namib-Naukluft Park, and the Namib-Naukluft Park day walks like the Olive Trail and the Waterkloof Trail. The Fish River Canyon Trail ranks as one of the top ten trails in southern Africa, not only due to its spectacular scenery, but the fact that it is a tough trail through the rugged southern desert environment that takes its toll on hikers, but at the same time offer the reward of accomplishment and being closer to nature than anywhere else. Namibia’s stunning scenery, wild open spaces and solitude are ideally suited for horse rides and horse-back safaris. There is a variety of trails on offer, with operators across Namibia able to cater for diverse requirements and tastes. For instance, the Namib Desert Trail, a 400 km ride over 9 days from the Khomas Hochland to the Atlantic Ocean, has been ranked among the top horse-back trails in the world, while trails are also available in the Fish River Canyon area, in the Sperrgebiet in the south, and the Skeleton Coast in the north. Riders can explore Namibia on longer trails, while overnight and shorter breakfast and sundowner rides are also available. Namibia’s arid climate is ideally suited to camels and these hardy animals were commonly used for patrolling during the early 1900s. Sitting high on the back of a dromedary camel provides a completely different perspective of the beautiful Namibian landscape. With more than 650 species, Namibia offers excellent opportunities for birding enthusiasts at numerous easily accessible birding destinations throughout the country. Birdlife includes Namib endemics and species confined to the wetlands of north-eastern Namibia as well as tropical species that reach the southern limit of their distribution in Caprivi and Kavango. More than 20 Important Birding Areas (IBA’s) are scattered across the country, offering fantastic opportunities for this adventure with a difference. Of special interest to birders are the 14 endemic and near-endemic species. The dune lark (the only species confined to Namibia), Gray’s lark, Rüppell’s korhaan and the Damara tern are endemic to the Namib Desert. For the all-wheel-drive enthusiast, Namibia offers great off-road driving opportunities, whether from a self-drive perspective or as part of an organised tour. Environmental management is balanced carefully with the opportunity to drive to remote destinations and experience the spectacular scenery and isolation. Tracks include sandy, rocky and savannah options. For tourists interested in seeing the way some of the local tribes lived before the advent of modern development, various tours are available to see the traditional lifestyles. In the traditional San area to the east, tourists are able to live in San villages and experience and learn about this unique African culture, while the OvaHimba culture in the north-west of Namibia can also be experienced first-hand. Namibia’s national game parks like Etosha National Park as well as the private game farms and reserves offer great game viewing and tracking opportunities. Through the sustainable use of natural resources, the hunting industry is a valuable contributor to Namibia’s economic growth and the protection of wild species. The adventure tourism options included in this article is just a small selection of the entire range available to visitors in this spectacular country. From mountaineering and rock climbing, to diving, and adventure sports like mountain biking and ultra-marathons, there is a whole host of additional adventures waiting for the international adrenaline junkie. Contact us for more information or for assistance in arranging your adventure tour / safari to Namibia.